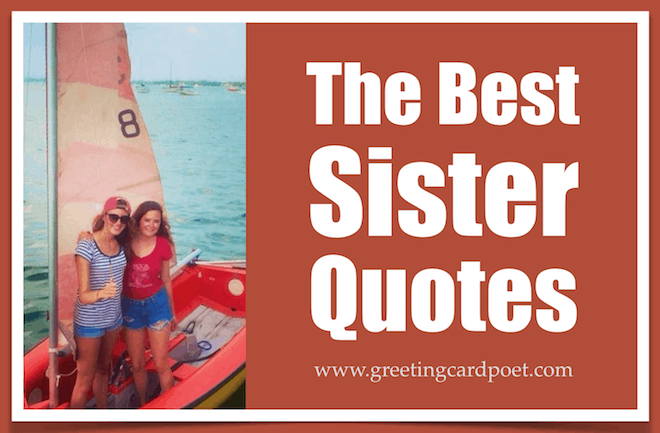 A special collection of sister quotes for some of the most important people in your life. While they can hit your hot buttons quicker than anyone, you know they always have your back. When you feel that you are down and everything is going against you, there can be nothing more supportive and encouraging than your Sis. They are the biggest constant in life that only the lucky ones can experience. It doesn’t matter how different you are in your personalities or how far away you are, you always have an unparalleled bond. Your sibling knows your secrets deeper than anyone else. She can spot the sadness in your laughter. Even if she is the most aggressive opponent you have, she can be your truest friend in times of need. Check out this collection of thoughtful words. When I say I won’t tell anyone, my sis doesn’t count. This is the person who has known you your entire life, who should love you and stand by you no matter what, and yet it’s your sister who knows exactly where to drive the knife to hurt you the most. She’s a little bit of childhood that can never be lost. Sometimes I open my mouth and our Mother comes out. Side by side or miles apart, we’re best friends connected by the heart. I really do love my sister. Especially when she’s nice. Sis: Sometimes it’s better than being a princess. We stick together like fat thighs. I can’t remember if I’m the good Sister or the evil one. If you want to know how old a woman is… ask her sister-in-law. Like this night has just changed how much I really trust and rely on her. I love you more than I’ve ever found a way to say. Without you, I’m like a bird without wings. I always like to win. But I’m the big sister. I want to make sure she has everything, even if I don’t have anything. It’s hard. I love her too much. That’s what counts. It’s so hard to be a big sister. I’m like a younger version of my Mom. I love my sister in-law. Like this night has just changed how much I really trust and rely on her. My first job is big sister, and I take that very seriously. My older sister is bossy, my brother is a stirrer and me – well, I am perfect! Behind every little sister there’s a sibling standing behind her holding a bat saying, You wanna say that again? An older sister is a friend and defender – a listener, conspirator, a counselor and a sharer of delights. And sorrows too. A toast once heard: To my big sister, who never found her second Easter egg until I’d found my first. A sister smiles when one tells stories – for she knows where the decoration has been added. The loveliest thing I know is….My sister. You’re on Sister Quotes page.